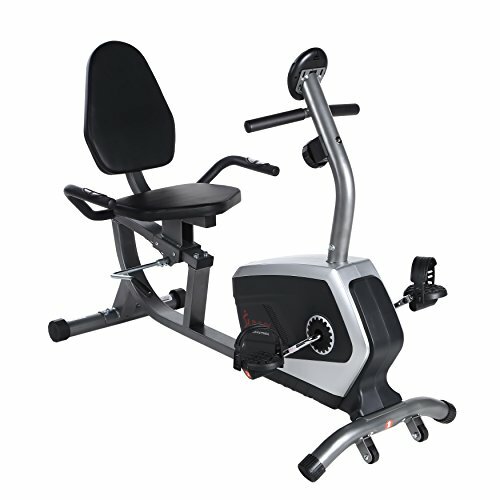 Sit back and workout with the SF-RB4616 easy adjustable seat recumbent bike. This bike allows for forward and backward adjustment of the seat without having to get up. The self leveling pedals make it easy to place your feet in the straps. Maximize your workouts with the adjustable 8 level magnetic tension control system. Track your workout progress with the LCD digital monitor that displays: scan, time, speed, distance, calories, odometer and heart rate. Convenient handles with pulse grip sensors will allow monitoring heart rate and workout intensity. The recumbent bike has built in transportation wheels for easy portability. The extended weight capacity can hold up to 300 pounds. Start today towards a healthier and happier you with the Sunny health and fitness SF-RB4616 easy adjustable seat recumbent bike.